YoYoExpert Blog & Yo-Yo News – 2015 Toys for Tots Yo-Yo Drive! 2015 Toys for Tots Yo-Yo Drive! For the past couple years our very good friend “Gibb” from Arizona has gone above and beyond by contacting us to make a donation of yo-yos to Toys for Tots. Every year we have matched that donation and consistently donated between 50 to 100 yo-yos! This year Gibb had an idea and reached out to us and we couldn’t have been more excited. We wanted to open this to the community as a whole and try and make this our biggest donation year ever. Gibb agreed he will donate one yo-yo for every ONE purchased! We said count us in too! And better then that YoYoFactory jumped in and said they are on board too! That means – if you purchase a YoYoFactory ONE yo-yo here for $8.50 we will actually donate FOUR yo-yos! Besides the amazing feeling that comes with this Gibb wanted to sweeten the deal for you! 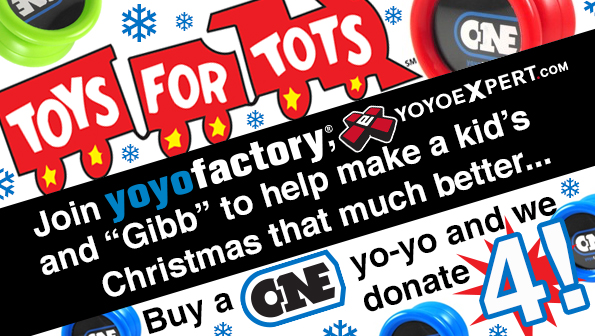 Every purchase of a Toys for Tots ONE counts as an entry for a chance to win a YoYoFactory Titanium DREAM! Plus even better than that if we reach 100 purchases (400 donated) there will be a YoYoFactory Nightmare included as a runner up prize! Special thanks to Gibb and YoYoFactory and YOU for making this possible! We will be splitting the donations of yo-yos between Arizona and Massachusetts so both East Coast & West Coast! Let’s make this a big year! Join us now! Last day to donate is December 21st! SUPPORT TOYS FOR TOTS HERE!